Charmayne Morrison points to a video of her dogs running in the snow this winter as she explains the sport to Polson Middle School kids. 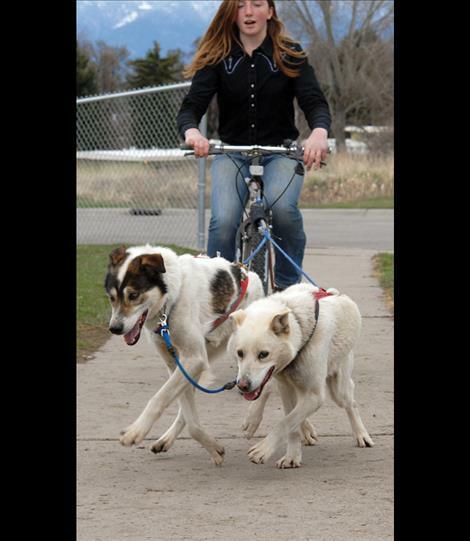 Charmayne Morrison harnesses her dogs Spritey, left, and Deluxe to demonstrate mushing. POLSON — When there’s snow in the Mission Valley, many people snowshoe, ski or sled. Eighth-grader Charmayne Morrison has taken up another winter sport — dog sled racing. 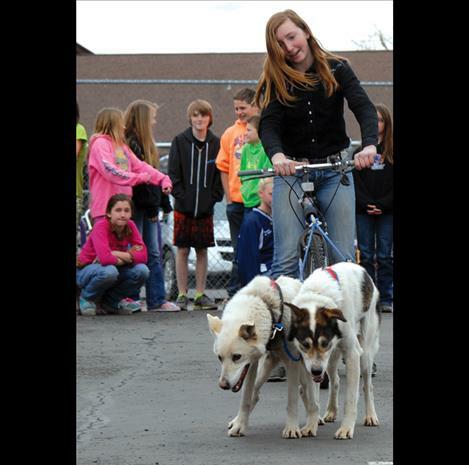 On March 24, she brought her sled and her two Alaskan huskies to Polson Middle School. 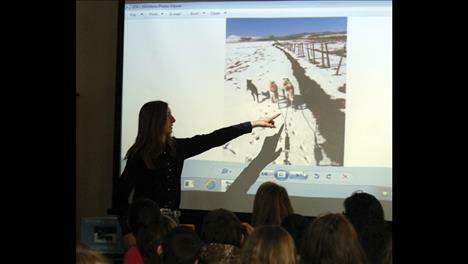 Having a musher and dogs on hands was a finale for all fifth-graders and some sixth, seventh and eighth-grade combined classes who have been monitoring the Iditarod Sled Dog Race. The racers and their dogs traversed 1,000 miles of Alaska and finished in Nome, Alaska, on March 18. Classrooms drew the names of mushers and “tracked” them on the Iditarod course using GPS and daily musher tracking charts from Iditarod.com, according to Amy Williams, resource teacher. Between those activities and reading about sled dogs and the racing, the students were excited to see Charmayne’s canines — Spritey, white with a charcoal throat, and Deluxe, white with black spots. They are older dogs, 10 and 11, but just right for a beginner, Charmayne said. Pooling their miles, Spritey and Deluxe have run 3,000 miles in races and another 7,000 to 8,000 miles in training runs. She also has a 5-month-old puppy, Cina. Charmayne’s sled is a basket-type, which she constructed from a kit. She displayed the sled and some dog harness in the library for students to look at as she told them about various parts of the vehicle, including the claw brake. Without much snow this winter, Charmayne has been exercising her dogs by harnessing them up and having them pull her on her bike. She takes them on the backroads near her house, and they run for 6 to 8 miles if it’s cold. If the temperatures are hotter and harder for the dogs, Charmayne works them for 4 miles, her shortest training run. “There’s not much traffic,” Charmayne said. 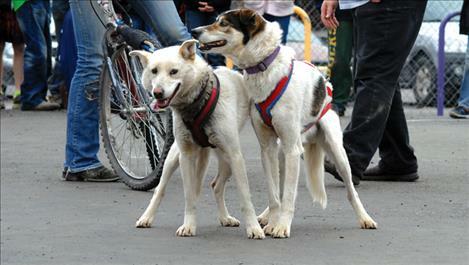 After harnessing up Spritey and Deluxe, she climbed on her bike to show students how she works her dogs on dry ground. The dogs respond to voice commands: “Gee” for turn right; “haw” to turn left; “go on by” or “leave it” to ignore something; “easy” for slow down; and “whoa” for stop, although sometimes they do what they want to and she has to pull up and get them lined out. Soon Charmayne will be teaching Cina to pull. Cina comes from Aaron Pecks, an Idaho musher. Alaskan huskies are a mix of breeds, usually a little Siberian husky or Malamute with other smaller dogs types, such as pointers or retrievers. The main attributes they need are endurance, speed, toughness, good feet, an ability to play well with others and a yen to go. “Puppies are broke to harness when they are 6 or 7 months old,” she said. Since Cina is little, Charmayne will wait until the pup weighs at least 35 pounds before she fits her out in a harness and booties. Then Cina will just run and have fun with the other dogs. “The first thing she’ll have to pull is a tire when she’s 9 to 11 months old,” Charmayne said. Cina will eventually be running in harness with a team of older dogs and begin her life as a sled dog. Charmayne has met mushers and dog breeders from around the state, and they’ve become Charmayne’s mentors, according to Tamara Fisher, School District 23’s gifted and talented teacher. “She’s really focused and loves mushing,” Fisher said. Charmayne got interested in dog sled racing just last summer, but her short-term goal is to compete in the 100-mile junior Race to the Sky event next year. Long term, Charmayne would like to run her dogs in the Iditarod. Expect to see her in the junior Race to the Sky, because her mentors have offered to loan her enough dogs so she’ll have a complete team.